Have a few of these myself. The marigolds will seed themselves of course but I still save a few seeds when they are finished blooming. Haven’t had much success with Lettuce, for some reason. One of the salad veggies I struggle to grow. Considering how much they cost I think I should knuckle down and have another go! I don’t hold out much hope for the marigolds or the lettuce surviving the billions of slugs in my tiny garden. But, they are pretty and I always did like the unique smell of a marigold flower. Oddly enough, slugs are no probs, but for the first time ever we have had a plethora of snails. As a rule, the King Cricket ( or Parktown Prawn as they are called locally – ‘orrible buggers too!) we get here takes care of them and the Hadeda Ibis keeps the Cricket in check. But for some reason hardly any crickets at all this year, thus the snails have had a mini population explosion. Why do you have problems with the marigolds? Ours are rampant and wherever a seed falls they seem to take every time. Slugs and snails love to eat marigolds, oddly enough. You would think with such a strong scent they would repel them, but no! We have snails, too – great big ones that I’m sure are edible, if I had a clue how to cook them. Hedgehogs are our only real slug-eaters. The corvids will eat snails, I think, as I find shattered shells on our old railway’s sleepers. I don’t think Irish slugs or snails know what gazania even is! I can’t grow anything brassica family, as so many pests here want to eat them, too. I might try broccoli again this year, but the cauliflower was a total disaster, trying to go it pesticide-free. 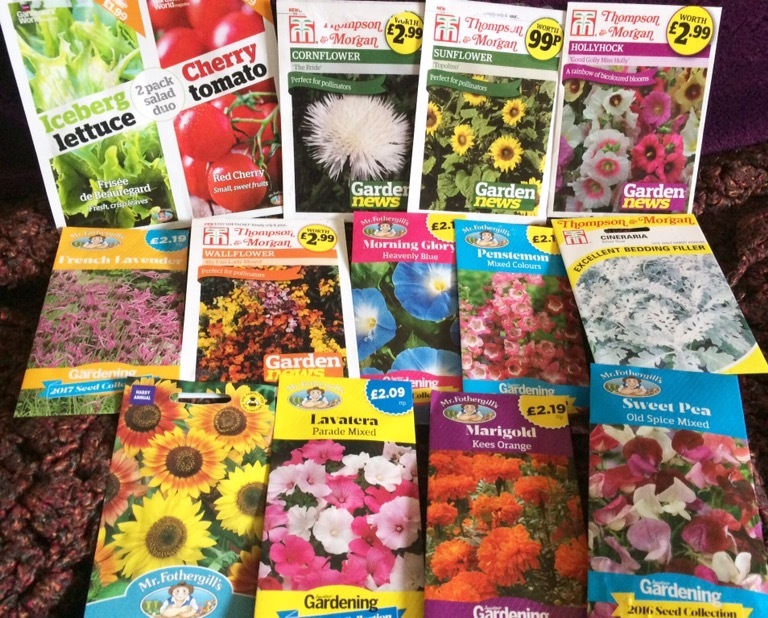 I will start my seeds on St. Patricks Day…so excited! What a brilliant way to celebrate the green! Yes! And if I were in to lots of veggies I would plant English Peas that day, but I stopped a couple of years back. WOw! Wish our garden magazines had free seeds! Lucky you! It really is! I will never lose my joy at seeing a little nugget turn into a beautiful plant. Best of luck as you begin the planting process. Haven’t bought a gardening magazine in forever but think it is so cool they (still) come with a “prize” inside. “Good Golly Miss Holly” is going to stick with me for a while. Laughed out loud at that one. Stay seedy! It’s a mostly UK magazine so I’m impressed with the vote going to a classic Little Richard song! I actually learn next to little from the magazines, but I appreciate his efforts to support my favourite thing to do.